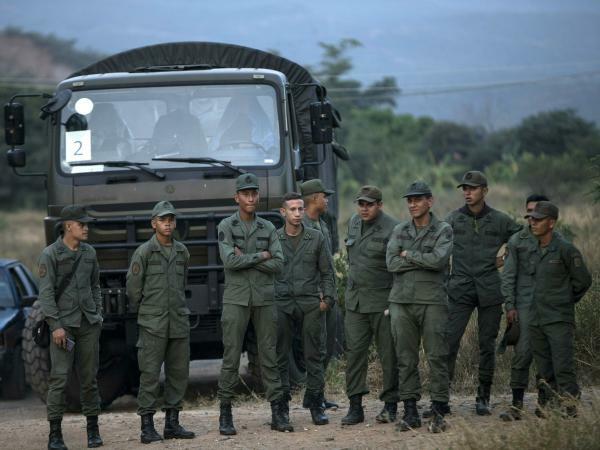 Soldiers stand at the entrance of the Tienditas International bridge that connects Venezuela with Colombia. Venezuelan President Nicolás Maduro, who is facing international pressure to step down after elections widely seen as rigged, ordered the country's vast border with Brazil to be closed. The move will make it harder for aid groups to get emergency food and medicine into the country. The U.S. and some other countries have recognized Juan Guaidó, the parliamentary opposition leader, as the legitimate president of Venezuela. Guaidó is embracing the support and has promised to bring in emergency aid to help the poor country. However, Maduro and his allies view the aid — particularly that coming from the U.S. — as part of an attempt to destabilize his government, ushering in regime change. Maduro has told Venezuelans that he believes the humanitarian effort is actually a pretext for a U.S. invasion. "Maduro has remained firm, saying that this aid at the border will not come in," NPR's Eyder Peralta, reporting from Venezuela, told All Things Considered. "He views it as a foreign invasion, and he has asked his military to act accordingly." Earlier this month, Maduro blocked one of the busiest highways on the Colombian border, preventing the entry of food and medicine there. Maduro said Thursday that he might also shut the border with Colombia, according to The Associated Press. A looming showdown may come to a head on Saturday. That's when Guaidó has declared that tons of international aid, currently warehoused along the border, must be brought into the country — either peacefully, or by force. So far the country's military has stood by Maduro, but President Trump has warned Venezuelan troops against trying to stop the flow of aid. "If you choose this path, you will find no safe harbor, no easy exit and no way out. You will lose everything," Trump said in Miami this week, directly addressing the Venezuelan military. To the crowd, he said, "End this nightmare of poverty, hunger and death for your people." Thousands of volunteers have amassed at the border to help bring the food and medicine into the country. Opposition politicians left the country's capital Thursday to drive to the border, but they were blocked by security officials. Peralta, who was traveling with the politicians, says that thousands of cars were blocked on one of the most important highways in Venezuela. After Maduro announced the Brazilian border would be closed indefinitely, Venezuelans rushed into Brazil to buy groceries, Brazilian media reported.